Website: In search engine of choice, type Comfort Inn of Pinehurst, N.C.
Weather-wise, I felt right at home Sunday when I awoke in Pinehurst, N.C. It was raining and unseasonably cold for these parts at this time of year. 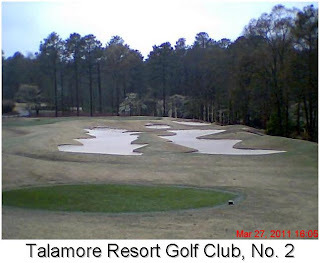 Did I make the short drive from my hotel to Talamore Golf Club to keep my scheduled 9:32 a.m. tee time on the Resort Course, or did I pass on playing and go to the course to meet golf pro Jason Aslanian and pick his brain about the highly regarded Rees Jones design? Even as I pulled into the parking lot, I wasn't sure which way I was going to go. Then I spotted two foursomes braving the conditions and preparing to tee off. The nutty golfer in my head took over. Real men play on a day like today! So, I grabbed the heavy wind jacket, pulled it over my head and went inside to tell Jason I was good to go and we'd talk later. 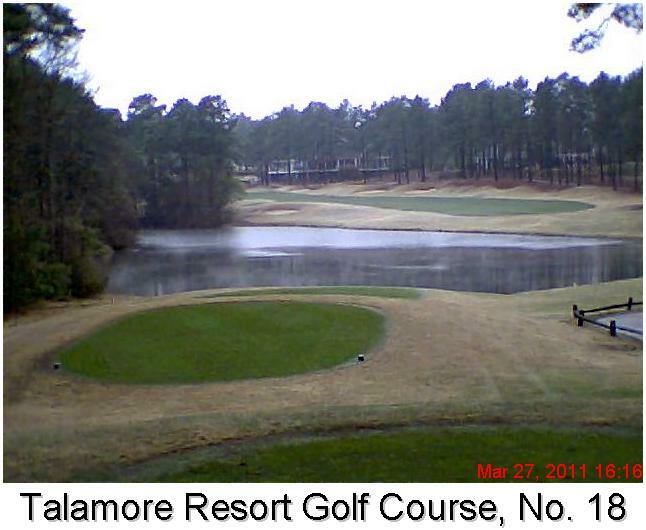 Notwithstanding the cold and intermittent mist, the course was extremely playable. Hey, this area is called the Sandhills for a reason. True enough that rain had fallen throughout the night and early morning, but the sandy soil drains quickly. Speaking of sand, there are sand bunkers and sand traps on every hole at the Resort Course. I didn't count them, but there are easily over 100. Some are small, some are large, and many are strategically placed in landing areas for tee shots and around the greens. The Resort Course is pleasing to the eye and easy to navigate. It was cart paths only Sunday, but I didn't find walks to the ball bothersome. The walking made me feel warmer. As I played back-to-front, I was already as loose and warm as I was going to get when I made the turn to the par-5 first hole. At 609 yards from the blue tees, and playing dead into the wind, I stood on the tee and sensed I could hit what by my standards are three good shots and probably not get home. Sure enough, I hit three solid blows - driver, 3-metal, 3-metal - and was 10 paces short of the green. I hit a nice bump-and-run chip to three feet and made a workingman's par. It felt like a birdie. There are a lot of nifty holes on the Resort Course, all of them straightforward and most of them featuring elevation changes. As is the case with all of the upscale courses around here, Talamore qualifies for consideration by "Affordabili-TEES'' because it is included in many of the reasonably priced lodging-golf packages for Pinehurst-area courses. Check out the websites listed above for the Comfort Inn and Pinehurst, Southern Pines, Aberdeen Area Convention and Visitors Bureau. - This trip is reaching its late stages. 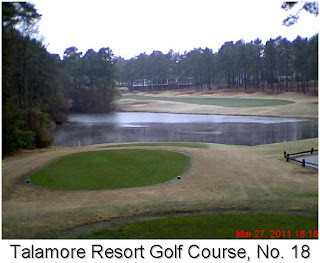 Weather permitting, I'll bid farewell to the Sandhills on Monday with a morning round at Little River Golf Resort in Carthage. From there, I'll lead north to Asheboro to check out some of the courses in that area. On Tuesday afternoon, the clubs will go back in the trunk for good and DSG will be homeward bound. - In the trip's second dispatch, from Winston-Salem, N.C., I regretted losing the scorecard from the round at Tanglewood Championship Course on which I'd written the full names of playing partners Jacob, Reggie and Edmund. Yesterday, I got an email from Jacob Davis, who filled in the blanks for Reggie Little and Edmund Harvey.